Rhode Island recognizes three levels of Emergency Medical Technicians (EMT). EMT certification in Rhode Island for two EMT levels is available for those who have successfully obtained national level EMT certification. Clearing a state level exam is necessary for operating as an EMT at the remaining level. Although the terms certification and license are used interchangeably, they respectively mean permits at the national and state level. EMTs provide emergency medical services to patients of trauma, bleeding, illness, cardiac problems, accidents etc. before and during the shifting of such patients to a medical facility. The certification – licensure process allows only qualified personnel to handle such tasks. National level EMT certifications are provided by the NREMT. Five levels of EMTs are recognized by the NREMT and each certification is valid for two years at a time. The usual procedure is this: a student passes an entry level EMT course of a particular level and within two years (usual duration) applies for NREMT certification of the same level. On clearing the national certification exams, he can apply for a state level license. The elementary course needs to be approved by the respective state and by the U.S. Department of Transportation EMT – Basic National Standard Curriculum. Certification exams include a cognitive exam that tests the candidate’s grasp over theoretical aspects such as trauma, oxygenation, EMS operations, ventilation, cardiology and the like. Depending on the level of EMT applied for, there are between 70 to 150 questions to be answered on a computer within 1 hour 45 minutes to two and half hours. The other part of certification exam is the psychomotor exam that checks if the applicant has the stomach to deal with medical emergencies. 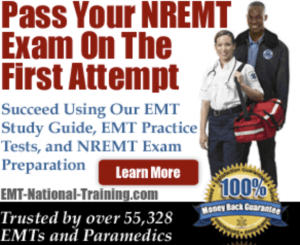 EMT Practice Test and EMT Achieve by Brady Publishers are two excellent online sources for preparation of NREMT certification exams. The former is part of an online guide complete with study material and online tests that are immediately assessed and scored. EMT Achieve is a distinguished source in that it provides notes supplemented by pictures, slides, animations, videos, and illustrations for thorough understanding. Answers to practice tests come with explanations making this a good source even for similar state level exams. For obtaining EMT-B and EMT-P level licenses, the candidate needs to pass the entry level course of the corresponding level and then the NREMT certification exams for the same level. EMT-C level licenses are available who clear the state level exams after passing the entry level course for the same level. This exam for the EMT-C license is given by the said licensure authority.